LONDON (Reuters) – A small whale was spotted in the River Thames in central London on Friday, a rare event which drew large crowds of sightseers. A whale expert from the Natural History Museum said it was a Northern Bottle-nosed Whale. Witnesses said it was between 5 and 8 metres in length. “The Natural History Museum has been recording strandings since 1913 and this is the first record of this species for the Thames,” the expert, Richard Sabin told Reuters. Peter Evans of the Sea Watch foundation said the creature could be so far up the river either because it was sick and had become disorientated or had simply got lost chasing fish. “Sighting of things like Porpoises in the estuary have become more frequent in the past five years – indicating that fish have become more abundant which in turn shows how much cleaner the river is than it used to be,” he told Reuters. Police boats tracked the animal as it cautiously circled, moving gradually upstream, and television cameras carried the images live. 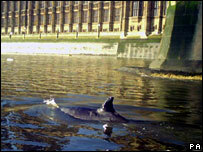 A whale has made its way up the River Thames to central London, where it is being watched by riverside crowds. The northern bottle-nosed whale, which is 16-18ft long and is usually found in deep sea waters, has passed Parliament and is moving upstream. “I saw it blow, it was a spout of water which sparkled in the air,” said eyewitness Tom Howard-Vyne. A boat has been sent to protect the whale and rescuers have been trying to keep it away from the Thames’s banks. It has come within yards of the banks and has crashed into an empty boat, while trapped in a narrow estuary between the banks and moored vessels. Vets are remaining on standby, experts have said it does not appear to be ill, but are concerns it will get weaker and may become beached.